(LOCATION: Treasure Island FL) This Hydra-Sports 230 WA is a lightly used, well-equipped, and good-looking express. She has an enclosed helm, open cockpit, and all the amenities needed for successful fishing along with cuddy cabin for cruising and getaways. The 200 horsepower Johnson engine guarantees economical and dependable performance. The comfortable cabin is designed for overnight and weekend getaways. The forward v-berth sleeps two. There is an overhead hatch for light and ventilation, rod racks for storage, and sound system for entertainment. The compact galley has a freshwater sink and carry-on cooler. The self-contained head compartment stows away when not in use. The starboard helm is equipped with T-top, rocket launchers, spreader lights, and lockage storage. The fully-equipped helm has aluminum wheel, hydraulic steering, compass, VHF radio, Navman fish finder, and Garmin GPSmap. Dual helm seats and transom fold-down jump seats provide seating for four. Cockpit features coaming bolsters, under-gunwale rod racks, under-seat live wells, in-deck fish boxes, and room to maneuver. The bow features stainless steel roller, anchor, stainless steel bow rail, and side deck walkaround. Power is provided by a Johnson 200-hp engine with transom engine mount for optimum positioning.. Lift-stored with no bottom paint this 23’ Walkaround is ready to go. 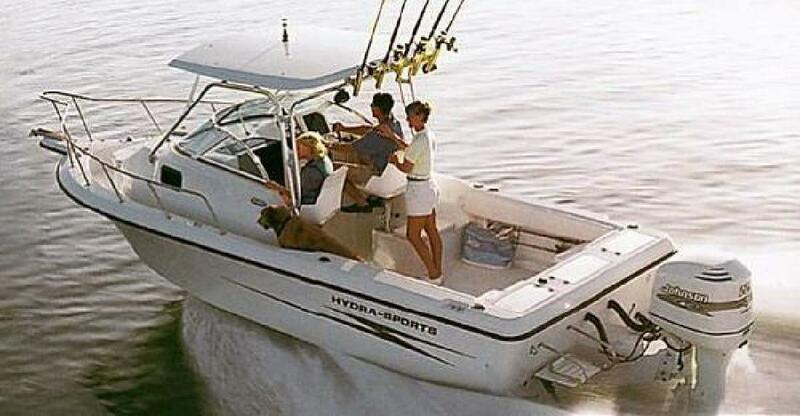 Call now for more information and to schedule a showing of this Hydra-Sports 230 WA.